FOXBOROUGH, Mass. – Give ’em a hand: Tom Brady and the New England Patriots are heading back to the Super Bowl. 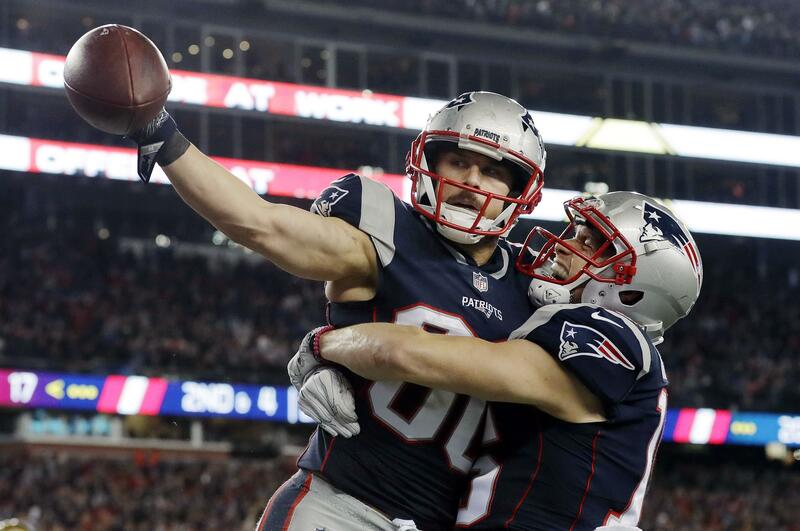 Brady shook off a hand injury and threw a 4-yard touchdown pass to Danny Amendola with 2:48 remaining, rallying the Patriots to a 24-20 comeback victory over the Jacksonville Jaguars in the AFC championship Sunday. And, with the game – and the season – possibly on the line, the Patriots star came up big again. Brady finished 26 of 38 for 290 yards and two touchdowns to Amendola for the Patriots (15-3), who’ll play the Philadelphia Eagles in Minneapolis on Feb. 4. It’s the eighth Super Bowl appearance for Brady and coach Bill Belichick, who have won five times – including last year’s 34-28 overtime rally against the Atlanta Falcons. Jacksonville – looking to reach the Super Bowl for the first time in franchise history – had one more shot, but Bortles’ throw on fourth-and-15 to Dede Westbrook was knocked away by Stephon Gilmore. The Patriots ran out the clock, with Dion Lewis’ 18-yard scamper with 90 seconds remaining sealing the victory. And they played most of the game without tight end Rob Gronkowski, who left late in the first half and didn’t return. He reportedly suffered a concussion. Brady’s hand was the most-scrutinized body part in Boston since his ankle before the 2008 Super Bowl, and Red Sox pitcher Curt Schilling’s right ankle tendon – the bloody sock – in the 2004 playoffs. A wide-open Marcedes Lewis gave the Jaguars a 7-3 lead 45 seconds into the second quarter with a 4-yard touchdown catch from Bortles. And their quarterback delivered – with some help from two big penalties. Josh Lambo gave Jacksonville a 17-10 lead 4:37 into the third quarter with a 54-yard field goal. He added a 43-yarder eight seconds into the fourth quarter to make it a 10-point game. Published: Jan. 21, 2018, 3:26 p.m. Updated: Jan. 21, 2018, 9:27 p.m.